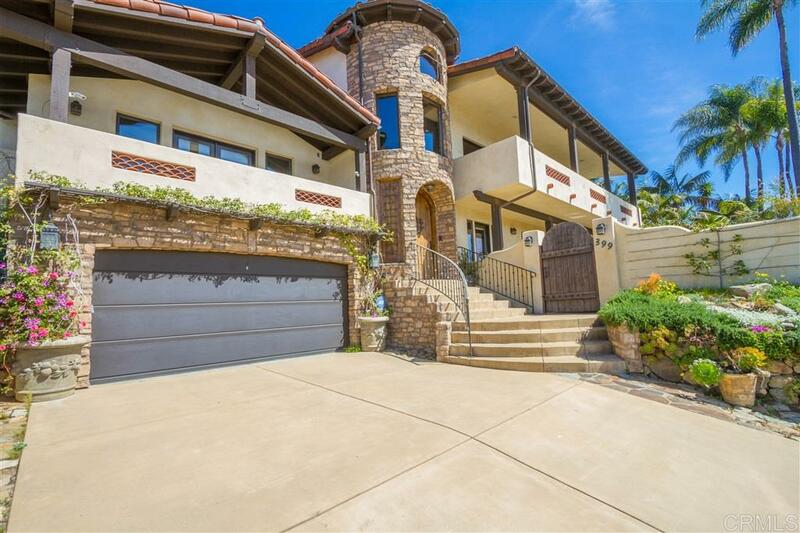 Ideally situated within walking distance to Encinitas village, beach & train station. This stunning Euro designed home embraces sensational sweeping sunset and panoramic ocean views from nearly every room. Masterfully redesigned and custom crafted in 2006 with lots of character and attention to detail. This exquisite home affords elegant entertaining as well intimate areas for quiet reflective moments. A lifestyle of enjoyment, pleasure & peace. Capture the essence of a So Cal beach community lifestyle., Enjoy cooking and entertaining from a gourmet kitchen that has it all: Viking range/oven, Sub Zero fridge/freezer, 3rd oven and a warming drawer! Mega huge walk-in pantry. Who wants just an island when you can have a continent for all your friends and family to gather around. This is a must see home even if it's not the right home for you! PLEASE CLICK ON VIRTUAL TOUR LINK BELOW PICTURE TO SEE 3D VIRTUAL TOUR AND DOLL HOUSE VIEWS!